Leather chairs take many shapes and styles; perhaps the one that comes foremost to mind when asked is the distinctive chesterfield sofa. But of course there are many different types of leather chair such as the club chair, dining chair, office chair as some examples. Firstly we have to consider what is leather and how do we get quality and essential finish. In its broadest sense, leather is any type of tanned animal hide; different types of leather are characterized by both the type of animal skin used and the tanning and manufacturing methods employed. Most common is cow hide and is the one that is normally used in the manufacture of leather chairs and other furniture. The hide is cleaned and tanned using chromium salts and then hand selected, following which it is dyed and fixed in its final colour. 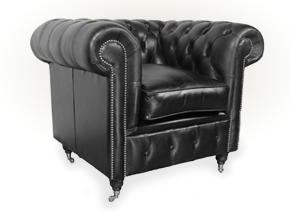 We are all familiar with the chesterfield sofa which is a classic piece of leather furniture. Increasingly popular are club chairs which used to be associated with the Westminster gentleman's clubs, British embassies worldwide, and hotel reception areas, now this classic is seem more and more in homes. The wing chair, tracing its roots back to the 18th century, is timeless which looks at home in any setting. Formally designed to keep the user free from draughts when homes were heated by open fires, the wing chair in the many colours of leather now available can look great in any setting. It can be easy to be carried away by finding a leather cheap club chair but that may be just what it is. At Club Chairs.co.uk with like for like quality we believe that you will not find a club chair more competitively priced. All the club chairs, and there are nineteen distinctive styles from which you can choose, are constructed with the important frame using only kiln dried low knot count hardwood beech, dowelled and screwed with a ten year guarantee. You can choose from three style of leather finish, antique with ten colour options, premium leather, which is finer than antique in eighteen colours or the ultimate in leather finishing hand dyed offered in five traditional colours. Ask anyone who has put club chairs in their home and they will tell you that it adds that ambience and comfort not easily achieved by the traditional three piece suite, your friends and neighbours will notice too!